The one big problem with GoDaddy dropping the Daily Stormer. Activists got domain registries to pull the plug on the Daily Stormer. Could that come back to haunt them? 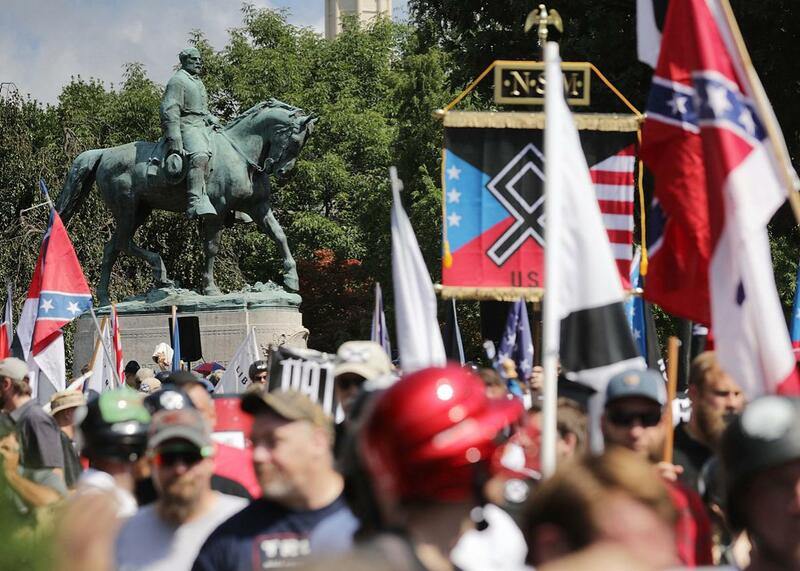 The statue of Confederate Gen. Robert E. Lee stands behind a crowd of hundreds of white nationalists, neo-Nazis, and members of the “alt-right” during the Unite the Right rally Saturday in Charlottesville, Virginia. For years, an online speech battle has played out on social media platforms such as Twitter, Facebook, and Reddit. It typically goes like this: Activists pressure the company to crack down on content they consider offensive. In some cases, they call for a user or organization to be banned outright. The social media company then has a choice: Take action, or disclaim responsibility for the content. That war is still raging, and the violence by white supremacists in Charlottesville, Virginia, over the weekend prompted an unprecedented crackdown by Facebook on both article links and private groups affiliated with the movement. But this week also saw the opening of a new front, in which the stakes are potentially even higher than they are on social media. That front lies deeper within the web’s infrastructure, in the realm of web hosts, domain registrars, and various other web services. The companies that provide the back-end services of the web have historically resisted pressure to police the behavior of sites that use them and have mostly avoided the spotlight in controversies over online speech. After Charlottesville, that may be changing. For months, groups including the Southern Poverty Law Center and the Anti-Defamation League have been pushing various web providers to cut off service to openly racist and anti-Semitic sites. The breakthrough came on Monday, when the domain registrar GoDaddy canceled the registration of the Daily Stormer, a neo-Nazi site that published an article attacking Charlottesville victim Heather Heyer. The Daily Stormer transferred its domain registration to Google, and almost immediately, Google shut it down too. As of Wednesday, the site could not be reached—but a copy of it was posted to a Tor hidden service, part of what’s known as the dark web because it isn’t indexed by search engines. For now, it seems, the Daily Stormer has been driven underground. To those who believe that the Daily Stormer’s blatant racism has no place in civil discourse, that might sound like an unambiguous victory. Facebook has long permitted racist organizations to flourish on its private group pages; Twitter has famously struggled to enforce its own policies against hate speech; Google’s search engine dutifully links to the Daily Stormer and other hate sites for anyone seeking them, as long as they’re on the public web. Yet in a matter of hours, the entire site disappeared when a pair of prominent domain-name registrars refused to serve it. Building on their momentum, activists are now taking the fight to Cloudflare, a web performance and security firm that as of Tuesday was still listed on the Daily Stormer’s nonfunctional website as protecting it from denial-of-service hacks. On Wednesday, there were reports that even Cloudflare had backed away. But the campaign’s success comes with some risk for those who care about free expression on the web. Cutting off domain hosting is a potent weapon against the purveyors of objectionable content—and it could be double-edged. Now, some of the internet advocates who opposed SOPA find themselves conflicted to see that same punishment applied in a different context. Yet in a time when hate-spewing “alt-right” groups are using the web to organize violent demonstrations, previously obscure tech companies have come under mounting pressure to police those pipes. In May, Vocativ’s Sara Morrison blasted the hosting company Squarespace as “the web platform of choice for the alt-right,” noting that it appeared to be ignoring its own policies against bigotry. That same month, ProPublica took aim at Cloudflare for the services it provides to the Daily Stormer in an article headlined, “How One Major Internet Company Helps Serve Up Hate on the Web.” The piece exposed a particularly troubling practice in which Cloudflare passed on to the Daily Stormer the names and email addresses of anyone who complained to Cloudflare about the site’s neo-Nazi content. Several of them were subsequently harassed and threatened. Cloudflare later told ProPublica it would amend that policy. But Cloudflare’s CEO, Matthew Prince, had until now staunchly maintained his right to work with even the most incendiary clients, including the Daily Stormer. “A website is speech. It is not a bomb,” he wrote in a 2013 blog post defending his company’s relationship with a Chechen site accused of fomenting terrorism. Other internet companies’ stances have proved more malleable, as the industry appears to be re-evaluating its posture toward hate groups in the wake of Charlottesville. WordPress on Tuesday stopped hosting bloodandsoil.com, the website of a fascist alt-right group in which alleged Charlottesville killer James Fields claimed membership. As Fast Company explains, that was a reversal from its previous “no-censorship” posture. Axios names Reddit, PayPal, GoFundMe, and Airbnb among the other major platforms that have taken measures against the alt-right in recent weeks. The CEO of chipmaker Intel joined several other CEOs in resigning from one of President Trump’s business advisory councils. Even Tiki, maker of the Tiki torches that the white supremacists held at the Charlottesville march, has publicly distanced itself from the movement. While we detest the sentiment of this site and the article in question, we support First Amendment rights and, similar to the principles of free speech, that sometimes means allowing such tasteless, ignorant content. In instances where a site goes beyond the mere exercise of these freedoms, however, and crosses over to promoting, encouraging, or otherwise engaging in violence against any person, we will take action. In our determination, especially given the tragic events in Charlottesville, Dailystormer.com crossed the line and encouraged and promoted violence. Of course, it would be naïve to expect such companies to perfectly enforce their terms against all clients at all times. Public pressure has long been an important lever by which activists can compel companies to take actions that it otherwise might not. And while it’s fair to argue that GoDaddy should have cut ties with the Daily Stormer long ago, that doesn’t make it wrong to do so now. Generally speaking, the argument that social media platforms bear no responsibility for what people post on them has failed. Twitter, which once dubbed itself the “free-speech wing of the free-speech party,” backed down from that stance in recent years as it became clear that abuse and harassment posed an existential threat to its business. Facebook has typically been more comfortable removing content that it deems offensive, but it only reluctantly agreed in the past year to exercise some forms of editorial judgment in response to its fake-news problem. Google has blacklisted fake-news sites from its ad network. All three have now come around, in various ways, to the view that they have at least some role to play in promoting civil discourse, beyond simply handing a megaphone to anyone who wants it. That’s in part an acknowledgement of the reality that the structure of their platforms plays an important role in shaping the way we communicate online. For example, Facebook’s news feed, as I’ve explained, inherently prioritizes certain types of speech and interaction over others. In other words, it can’t credibly claim neutrality with respect to content when its algorithms are already tilting the playing field. The argument that web hosts and domain registrars should refrain from policing the content of the sites they serve, however, seems like a stronger one. GoDaddy’s service doesn’t distinguish between “high-quality” and “low-quality” content the way Facebook’s or Google’s algorithms do. Cloudflare may serve hateful or violent clients along with laudable ones, but it isn’t in the business of recommending or suppressing their content. The distinction between the Daily Stormer and an antifa site, or even a Black Lives Matter site, might seem clear as day to those urging GoDaddy to intervene against the former. Yet if our president himself finds them equivalent, it isn’t hard to imagine a private tech-infrastructure firm deciding to ban the latter along with the former. Those back-end service providers may look like attractive targets for progressive activists today, when they hold the power to exile a noxious and violent white supremacist group to the web’s shadows with the flick of a switch. And perhaps this will all end well if it leads to a sustained campaign to get web infrastructure providers to enforce their terms of service more consistently—that is, if it reinforces rather than removes the high bar for taking action against blatant offenders. But it’s hard to shake the feeling that concentrating editorial discretion in these companies’ hands is a gambit that will eventually backfire.